We got back from another amazing beach vacation a few days ago so our tans are still looking good, I still have a soild 5 lbs of sand in my car, I seriously haven’t fully unpacked yet and I am pretty sure my kids still have sand in their hair. Its SO HARD to wash out. I joke I need a pressure washer for my kids. They loved doing sand angles at the beach. I have to admit I thought ( HA HA) that summer was going to be a little slower paced than the school year and I would be able to get more posts done than my usual once a week. I am really trying to get to 2-3 recipes a week up on the blog. Um, yeah. Summer has been busy! Between swimming and tennis lessons for both my kids, me playing tennis ( I compete in league tennis as well), my husband working extra hours so we could go on two beach vacations ( which were both so awesome) and us having lots of days at the pool, I have just been way busy and my recipe creating this summer has been slow. I saw quality and not quantity, right? Speaking of quality, this curd. I love making curd and love curds swirled into ice cream. 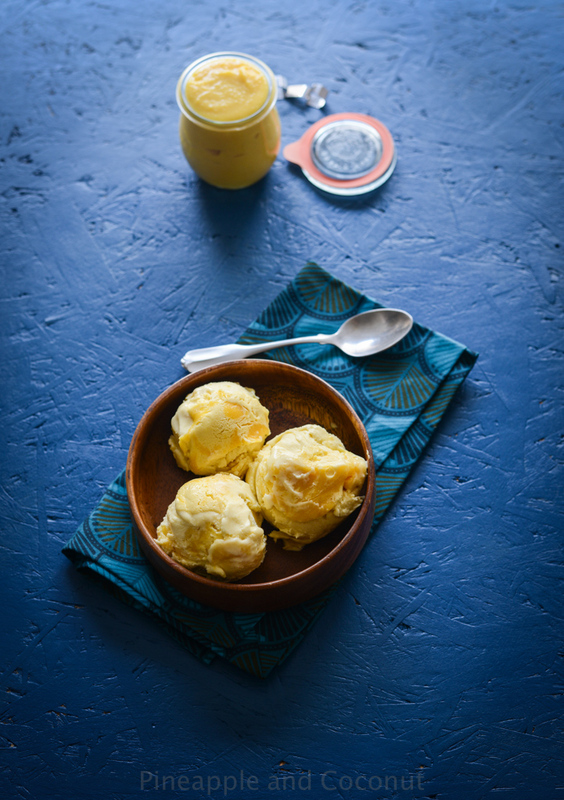 So I thought to myself “I should make a pineapple curd swirled ice cream”. Well I made it. Then it sat in my fridge for two days before I churned it. Then I froze it. Ummmm I won’t even say how long it was in my freezer before I finally photographed it. Busy summer… but here it is finally. 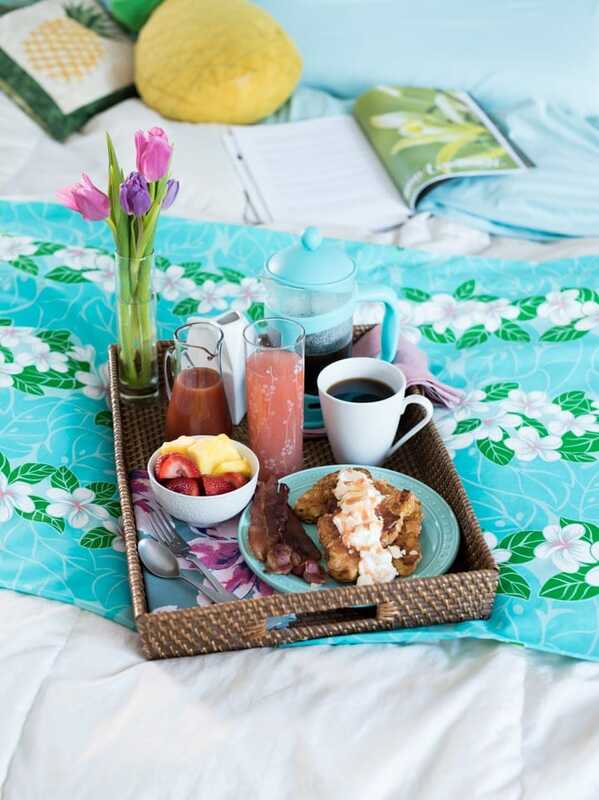 And since it is still summer, perfectly appropriate to make and eat. Also, the curd recipe makes more than what I added into the ice cream, and its so good on pancakes, waffles, yogurt, just a spoon shoved into you mouth. 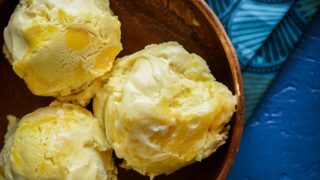 This ice cream is a little more time consuming than most, since it has to parts along with steeping the ice cream base for extra coconutty flavor, but it is well worth it. 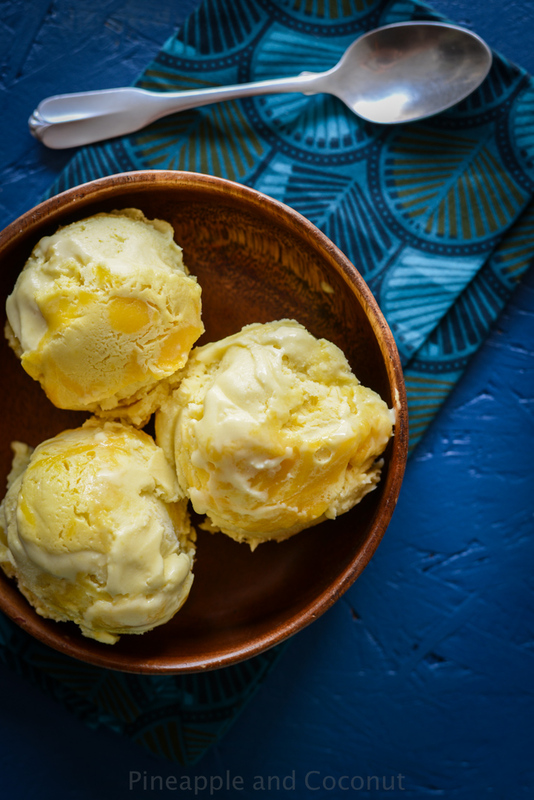 Plus the curd can be made ahead of time and good things come to those who wait and this ice cream is most definitely worth waiting for. On vacation this past week we went to an ice cream shop in Dana Point, Ca. that sells Lappert’s Ice Cream. Lappert’s is from Hawaii and their flavors are so amazing. Kauai Pie is my favorite, its a Kona coffee ice cream swirled with cake pieces, chocolate fudge, macadamia nuts and coconut flakes. Its my most favorite ice cream ever. I introduced my kids to the ” we can eat ice cream before dinner when we are on vacation” rule that I came up with and their eyes were as wide as saucers. They love vacation rules. So as far as I am concerned, its still summer vacation so go ahead and make and eat this ice cream, before dinner. 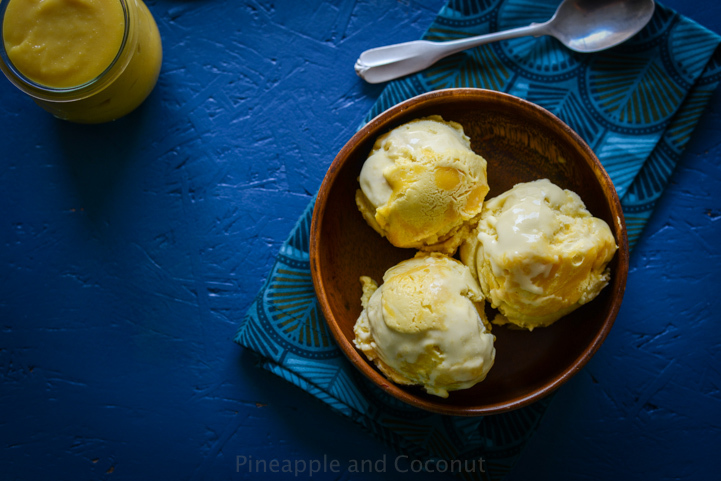 Coconut Ice Cream with Pineapple Curd Swirl Makes about 1 gallon of ice cream Curd Prep 10 min. Cook Time 15. 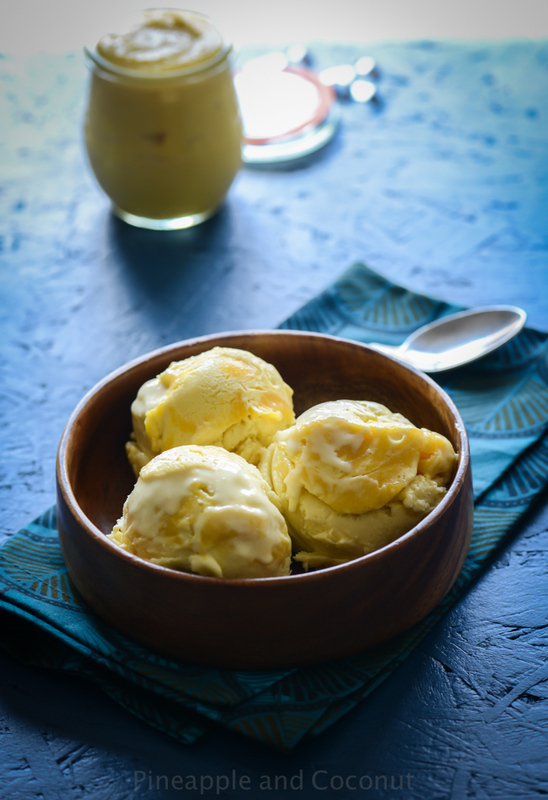 Cooling time 6 hours up to overnight Ice Cream Prep time 10 min., Cook time 15 min plus 1 hour inactive steeping time. Total time about 16 hours for both including overnight chilling time. 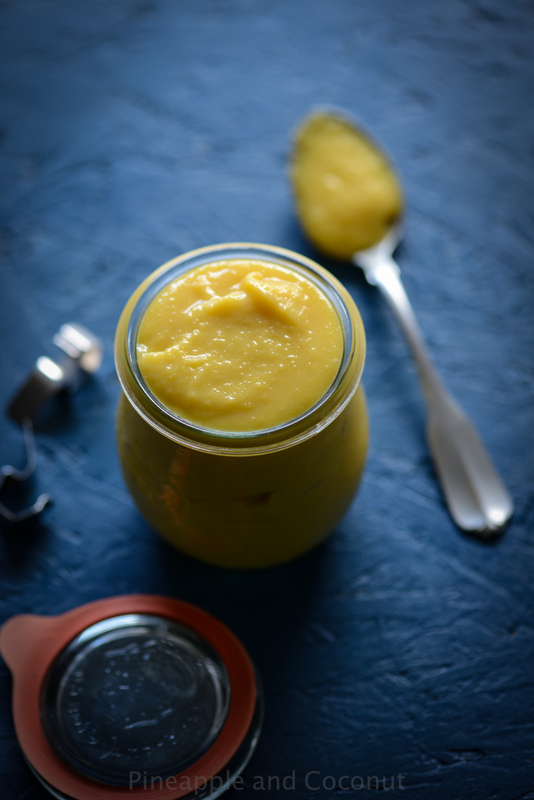 In a sauce pan combine the pineapple juice, crushed pineapple, sugar and egg yolks and mix well, stirring until the sugar is dissolved, being careful not to scramble the yolks. In a small bowl combine the starch and some water and stir until liquid, add to the pan and stir until the mixture is thickened, about 10 minutes. Remove from the heat and stir in the butter one tablespoon at a time until it is fully mixed in before adding the next. Strain into a bowl, scraping the strainer well with a spatula to get rid of all the lumps and cover with plastic wrap, pressing it against the top of the curd so a film doesn't form on the surface. Chill completely before using. The curd can be made up to a week ahead of time. Keep chilled in an airtight container. 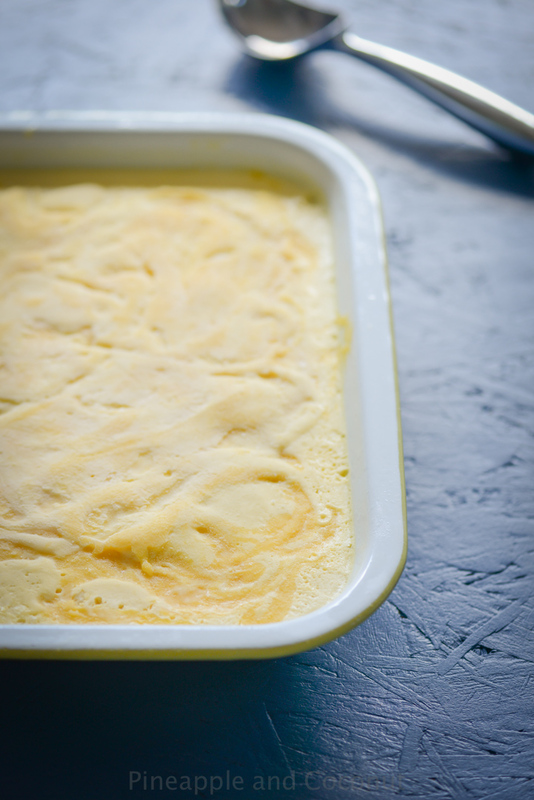 If longer than a week before use, the curd can be frozen. Just thaw in the refrigerator before use. 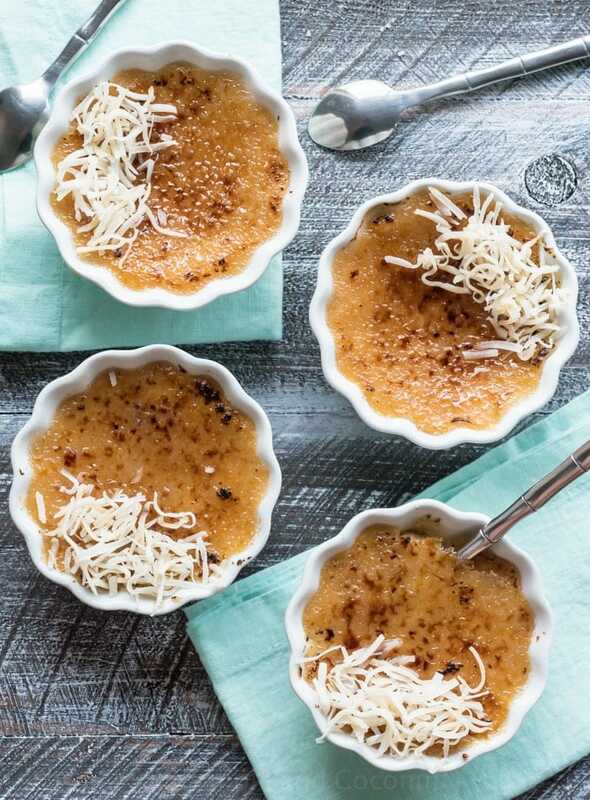 In a large sauce pan combine sugar, milk, 1 cup of the coconut milk and the shredded coconut. 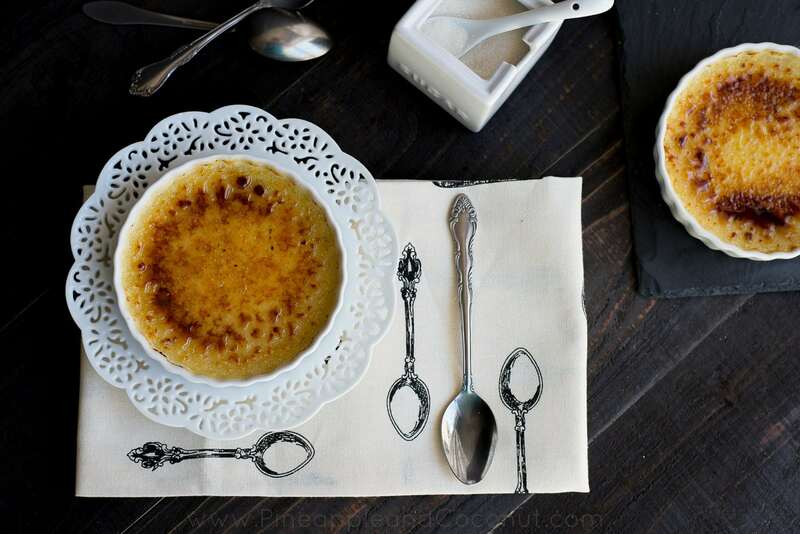 Heat until steaming, stirring until the sugar is dissolved and remove from heat. Let steep one hour. Place the remaining coconut milk in a large bowl and keep chilled. Have the egg yolks in another bowl next to the stove top with a whisk close by. After the milk and sugar mixture has steeped for one hour, strain out all the shredded coconut and return to the pan. Heat again until steaming and hot. Whisk the egg yolks and slowly pour in 1/2 cup of the milk mixture at a time to slowly heat the yolks, keep adding milk while whisking until the yolks are warm and then add the yolks into the saucepan, scraping the sides of the bowl. With a spatula, constantly stir the mixture over medium low heat until thickened and it coats the back of the spatula, being careful not to scramble the yolk, about 10 minutes. Once its thickened, strain into the bowl of the remaining chilled coconut milk to catch any bits of egg yolk that might have over cooked. Stir the mixture well and add in the extract and paste. Add in the optional coconut rum and stir again. Start layering the ice cream in a freezer safe gallon size container with the curd. Add about 1/4 of the ice cream and 1/2 cup curd, swirling with a knife or spoon and repeat until all the ice cream is added and there is one last layer of curd swirled in on the top. Freeze at least 4-6 hours before serving. There will be leftover curd. Now if you will excuse me, I have a tan I need to go work on. And some ice cream to eat, before dinner. Can I substitute corn starch or something for the arrowroot? Thanks!! !